Balance isn’t so hard to find if you’re searching the right spaces, and LA River Bend have definitely found a sweet spot. The band’s new single “Mountain” is a blending of worlds, a folk-rock anthem that compels us to shine. Atwood Magazine is proud to be premiering “Mountain,” the latest single off LA River Bend’s forthcoming EP, Run These Hills. 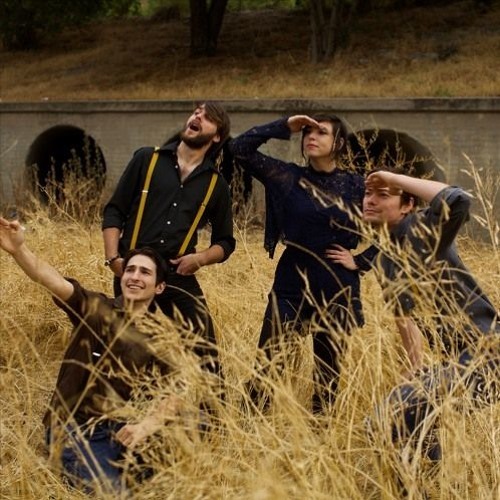 From the Golden State of California, Americana/folk band LA River Bend consists of Nate Weiner (Vocals, Guitar), Emily Elkin (Cello, Vocals), Branden Stroup (Bass, Vocals, Guitar) and Jacob Seldes (Drums). Emerging two years ago as a much more folk-based group, the band’s 2017 reintroduction finds them donning a harder-hitting musical identity that, in this writer’s opinion, strikes true gold. Their application of traditional folk melodies over rock-influenced dynamics is sure to leave a lasting impression on all who listen. “Mountain” is an excited embrace of all that is and all that could be, and just as Weiner says, it transcends distinct genre lines, mixing a dash of this with a heaping portion of that. We all have our own mountains to climb – obstacles we must face and overcome. Looking back, challenges seem so much easier than they felt at the time – and at the time, they can seem so very, very daunting. “Mountain” captures the intensity of what looms ahead, while affirming that there is another side beyond the pale, after everything is said and done, where we can look back and be proud of what we’ve faced. An invitation to join in celebration, “Mountain” is not to be missed. Stream LA River Bend’s passionate new anthem, exclusively on Atwood Magazine!